In Azerbaijan, prominent human rights defenders are being arrested; and NGOs raided. ‘Caviar diplomacy’ covers it all up. President Aleksandr Lukashenka of Belarus has recently released Ales Bielatski, a well-known human rights activist; such decisions are not taken without an agenda. It is easy to predict that Lukashenka is busking for scraps of positive reactions from Western states; and wants to demonstrate a certain level of independence from Vladimir Putin. 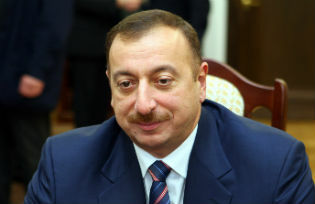 However, another dictator from the region – Ilham Aliyev, President of Azerbaijan – is using the current political situation in a reverse direction; and by arresting prominent human rights activists, he kills the last breaths of civil society in his country. In recent days, the most prominent human rights defenders in Azerbaijan have been arrested. Hasan Huseynli, acting far from Baku, in Ganja, was detained first. He is a renowned activist acting for people in the regions. Then, Leyla Yunus and her husband Arif Yunus were put behind bars. They were involved in the protection of citizens suffering from massive expropriation in Baku; and were promoting a peace process between Armenians and Azerbaijanis in Nagorno-Karabakh. On Saturday, 2 August, Rasul Jafarov, a thirty-year-old human rights defender was detained, and arrested for three months. Jafarov has visited Poland on many opportunities, the last time in June this year during the Freedom Games organised in Łódź. He was the mastermind of the ‘Sing for Democracy’ campaign organised during the Eurovision song contest, held in Baku in 2012. He was regularly counting the numbers of political prisoners; and struggling for a Council of Europe Parliamentary Assembly resolution, similarly devoted to political prisoners. Finally, on 8 August, Intigam Aliyev, a well-known activist and prominent lawyer in Azerbaijan, was arrested. He had won a dozen cases argued before the European Court of Human Rights. It is clear that the charges against these activists are spurious; all of them were charged with economic and tax offences, despite the fact they were operating a non-profit organisation. Last week, on exactly the same grounds, prosecution proceedings were opened against 21 non-governmental organisations. Anar Mammadli, the head of an independent think-tank monitoring elections, who dared to claim that the presidential elections held in the autumn were unfair, was jailed a couple of months ago. Ilgar Mammadov, the head of the opposition party, was jailed over a year ago. In his case, the European Court of Human Rights acknowledged that he is a political prisoner. Prominent journalists such as Tofiq Yagublu, Sardar Alibeili, and Parviz Hashimli have also been added to Ilham Aliyev’s collection of activists behind bars. The geopolitical situation of Azerbaijan and its plentiful energy resources substantially hinder the reaction of the West towards the worsening civil society situation in the country. Many European countries are aware of the situation but prefer to remain silent even when Ilham Aliyev is escalating repressions. Politicians prefer to wait for international organisations to act despite knowing that these are not effective by themselves. They avoid the engagement of their own countries. Sadly, this is also the policy of the Polish Foreign Affairs Ministry. Such an approach, although inexcusable, can be explained by a number of factors. Azerbaijan, moreover, is in a special geopolitical position, being a bridge between Russia and Iran; and with a frozen conflict with Armenia over Nagorno-Karabakh. Although inhabited mostly by Muslims, it is a secular country, and is a traditional ally of its bigger brother – Turkey. Ilham Aliyev plays on these considerations, acting as the guarantor of peace and security of the entire region, including protection against Iranian fundamentalists. But should these facts make Western countries afraid of protesting against Azerbaijan’s attempts to silence opposition voices? Are there any means of preventing Azerbaijan from laughing at and ridiculing democratic values? At the beginning of April 2014, Azerbaijan took over the Presidency of the Council of Europe, an organisation founded on democratic values, human rights and the rule of law. The speech of Ilham Aliyev at the Parliamentary Assembly forum in June 2014 sounded rather fanciful, especially when he tried to convince parliamentarians that there are no political prisoners in Azerbaijan. With his latest repressions, Ilham Aliyev has taken advantage of the fact that the world’s eyes are turned upon Ukraine, Russia, and Vladimir Putin, as well as the Israeli conflict in Gaza. By arresting activists and forbidding them to leave the country, he tries to silence people who were informing European public opinion about political prisoners, human rights violations, corruption, and the otherwise hidden doings of the presidential family. How dangerous were those activists for Ilham Aliyev? How much must he fear them in order to take such drastic steps? It only confirms how efficient they were in their work, condemning fraudulent elections, the detention of political prisoners, expropriations or the unexplained disappearances of journalists critical of the president. We are not looking for economic sanctions from the European Union, especially when we have seen what effect they have had on Russia. But if the West has decided to invite Azerbaijan into the house of European ideas, and if the West has imbued young Azeri activists with ideas of freedom, pluralism, tolerance, the rule of law, and human rights, then it is our moral duty to defend them when they are in trouble. Individual EU Member States, supported by the European Union, should make a joint effort to ask for their immediate release. Silence means betraying our own democratic values. Adam Bodnar is vice-president of the Helsinki Foundation for Human Rights, one of the leading human rights NGOs in Poland. Dominika Bychawska-Siniarska is a lawyer and project co-ordinator at the Helsinki Foundation for Human Rights.